Joan’s comments are astute and moving, as always. About them Flying Tigers…Strictly speaking, they did not fight for the Chinese before Pearl Harbor. The American Volunteer Group (the Flying Tigers) was recruited before we entered the war and was in training when Pearl Harbor was attacked. They first went into action on Dec. 20 1941, several weeks after PH, as part of the allied defense of Burma. As for the disturbed graves, who are the Chinese who fought with the Flying Tigers? It was an all American outfit, which was later absorbed into 14th Air Force, also all American. Is the story referring to the graves of members of the Nationalist Chinese forces? 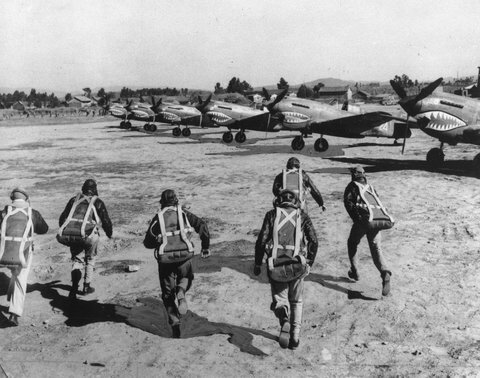 The New York Times article says, “In August, the grave sites of several hundred Chinese military personnel who served with the force — the Flying Tigers — were rediscovered on a trash-strewn hillside in the southern city of Kunming…. [T]he graves of about 500 Chinese translators, ground crew members and other personnel associated with the unit sit ignored and neglected on Changchun Hill.” Strictly speaking, they weren’t the Flying Tigers themselves, but support staff. But tell us more about the Flying Tigers, if you like. I know this is a specialty of yours!